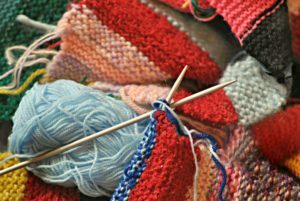 DEEP RIVER — Come join Deep River Public Library in the Community Meeting Room for Knit Together, which will next meet on Saturday, Jan. 27, from 1 to 2:30 p.m.
Bring your latest project or your wish list. The group is intended to create new knitters looking for instructional guidance as well as an enthusiastic community for those who want to share the craft. Bring your own supplies or purchase the basics at the meeting. Adults and children with an adult are welcome. Veteran crafter Wendy Sherman will facilitate the group and offer her knowledge based on 30-plus years of her own knitting. Call the library for additional information. For more information, visit http://deepriverlibrary.accountsupport.com and click on our monthly calendar, or call the library at 860-526-6039 during service hours: Monday 1 – 8pm; Tuesday 10 am – 6 pm; Wednesday 12:30 – 8 pm; Thursday and Friday 10 am – 6 pm; and Saturday 10 am – 5 pm.